two weeks ago i picked up two new splits with queens established. i immediately added a deep super to each one as the beekeeper i bought them from suggested. 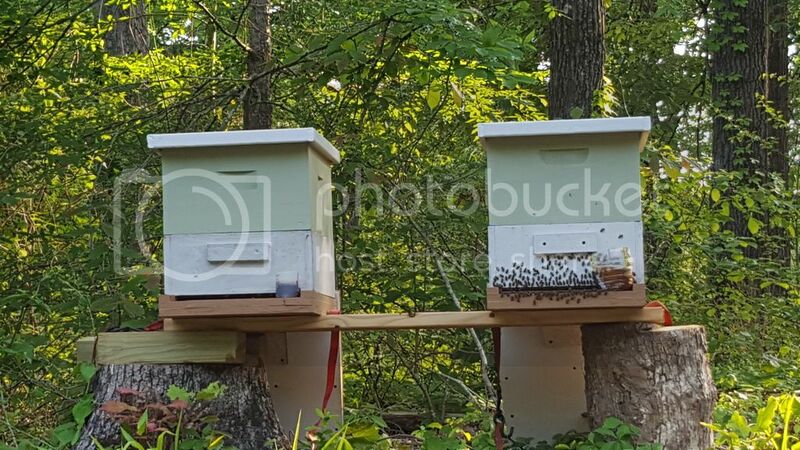 its been two weeks and i noticed one of the hives usually has a good number of bees hanging out on the front of the hive. there is alot of activity in the second super but they have yet to build comb up there. should i add another super to it? also, i gave them some old crystallized honey to feed on since we've had a longer than usual winter and still dont have a large pollen flow. would this help them or hurt them? > should i add another super to it? > i gave them some old crystallized honey to feed on since we've had a longer than usual winter and still dont have a large pollen flow. would this help them or hurt them? Hard to say. Assuming it is from a healthy hive and not rock hard, it will be beneficial. In any case it will be most helpful if you have scratched the cappings and placed it touching or in the cluster. It appears you have entrance feeders. They can work, but also can attract robbing if there are strong hives nearby or starvation if the weather turns nasty. (The combs of feed honey should prevent that).